“Fake News” is a major headline and buzzword these days. It’s good that we’re talking about ethics in publication, but the truth of the matter is that fake news is not new. Even defining fake news is difficult because journalism, politics, and social media all contain components of fact, opinion, and the gray area of perception or rhetoric. The key is to decide for yourself, and in order to make a sound decision, you need to have a solid, well rounded understanding of the topic at hand, that means thinking for yourself, ala Teach a Man to Fish. If we know how to smartly evaluate the information presented to us we can make rational decisions about its validity. 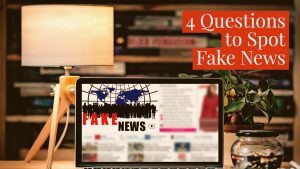 Below are four questions to ask when you are evaluating information from the media. Is this “Fact” or Opinion? An opinion includes statements like something is “Amazing” or “a Failure”. Those descriptors vary from person to person. These are not facts. A “Fact” is something that is indisputable. There is concrete proof and/or scientific data that overwhelmingly supports the statement. Beware the Twisted Fact. This one can get a bit tricky. One way to identify if a fact has been twisted is to seek a better understanding of the overall issue being presented. Rather than focusing on the questionable fact, make sure you understand and big picture and depth of the issue, there may be more to the story. Is the “Fact” from a Reliable Source? In the age of the internet, anyone can say anything. Having a list of reliable sources helps to distinguish what’s real from what’s fake news. Are quoted sources accurate and reliable? Perception is a funny thing that runs in the same gray area as a twisted fact. Curiosity, empathy, and an open mind are key. Liberal? Take a moment to really understand a conservative perspective, and vice versa. I’m not asking you to agree with them, just seek understanding. Put on your researcher cap and stay curious.